Australian shares closed marginally higher on Wednesday, as gains in resource stocks were partially offset by the major financials ahead of the royal commission’s interim report. The S&P/ASX 200 index closed the session 6.4 points, or 0.1 per cent higher, at 6192.3 after falling from a strong advance at the open. The energy and materials sectors continued to dominate the market movements on Wednesday and Brent crude prices lifted further on Tuesday night. Speaking before the UN General Assembly in New York City on Tuesday, US President Trump criticised OPEC, saying that it was “ripping off the rest of the world”. Trump’s comments did little to harm the price movement however as Brent crude rose close to 1 per cent. 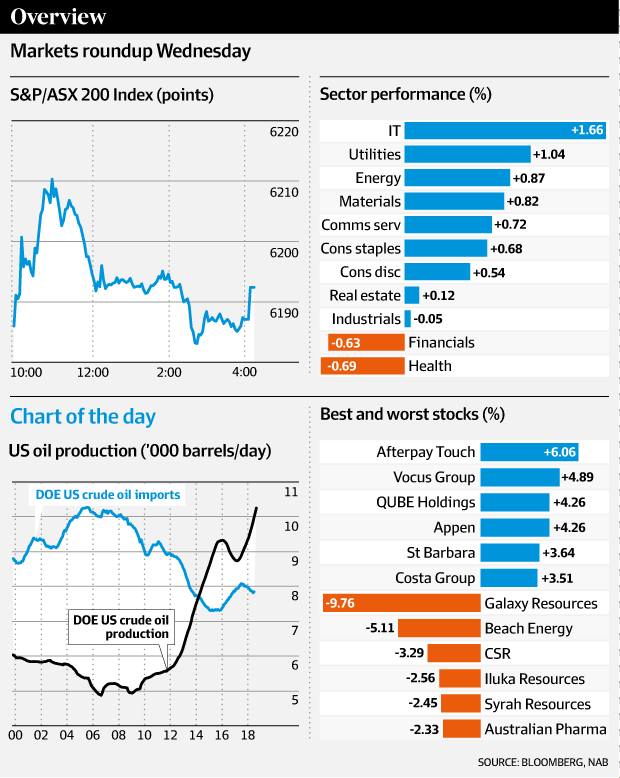 The energy sector was one of the best performing on the market on Wednesday. Woodside Petroleum was among the market leaders, lifting 1.5 per cent to $38.55, AGL Energy rose 1.9 per cent to $19.59, Origin Energy closed 1.5 per cent higher at $8.27 and Oil Search closed at $9.10, up 2.3 per cent. The major materials stocks traded higher on Wednesday despite some weakness in base metal prices on the London Metal Exchange on Tuesday. BHP Billiton closed the session 1.2 per cent higher at $34.50, Rio Tinto rose 1.2 per cent to $80.03 and South32 closed at $3.92, up 0.5 per cent. Whitehaven Coal closed 1.7 per cent higher at $5.45 after it was upgraded to ‘outperform’ by Credit Suisse. The broker said there were plenty of tailwinds for the company citing good cash generation and new coal prices as key upside risks for the company. The financial sector continued to trade lower ahead of the royal commission’s interim report with the major banks and insurers leading the market losses on Wednesday. Commonwealth Bank led the market losses, falling 0.9 per cent to $70.18, ANZ closed 0.9 per cent lower at $27.96, NAB fell 0.5 per cent to $27.45 and Westpac closed at $27.81, down 0.3 per cent. Suncorp Group fell 0.9 per cent to $14.37, Insurance Australia Group closed 1.1 per cent lower at $7.27 and Medibank Private closed the session at $2.85, down 2.1 per cent. Citi upgraded Telstra’s target price from $2.30 to $2.65 citing rising telco valuations overall as they key driver behind the change. Despite the valuation change, the broker still maintains its ‘sell’ rating on the stock and believes that the telco will be unable to generate sufficient cashflow in the coming years to maintain a 22¢ per share dividend in the long term. The broker says rising competition in the telco sector means Telstra’s 30 per cent mobile phone price premium is too large, with most of the growth in the sector coming from the lower price point of the market. Citi said that Telstra would need to adjust its pricing in order to hold its market share and cut its debt levels as earnings decline in the next few years. The broker said in a note on Wednesday that Telstra would need to find an additional $700 million in free cash flow in order to pay a 22¢ dividend in the long term. Oil production in the United States remains one of the key downside risks to oil prices in the next few years with President Donald Trump saying earlier this week that he did not want oil prices to keep rising. President Trump said that OPEC was ripping off the rest of the world as the price of Brent crude rose over $US80. NAB analysts noted on Wednesday that oil’s correlation with a poor US dollar could be behind the President’s rhetoric. “Although the correlation between oil and the USD is unstable over relatively short time intervals, higher oil prices are bad news for the US consumer and the US economy in aggregate even if they are a boon to the oil sector,” they said. The price of crude oil continued to rise on Wednesday, pushing past $US81. In a speech to the United Nations, President Trump reiterated the US’s hardline stance against Iran, who it has imposed sanctions against. Purchasers of Iranian oil have indicated that they will cut orders from the Islamic Republic, with India announcing it would stop buying barrels from the country from November. Iranian’s exports are set to continue to fall on the back of this and remains one of the key drivers behind higher oil prices. 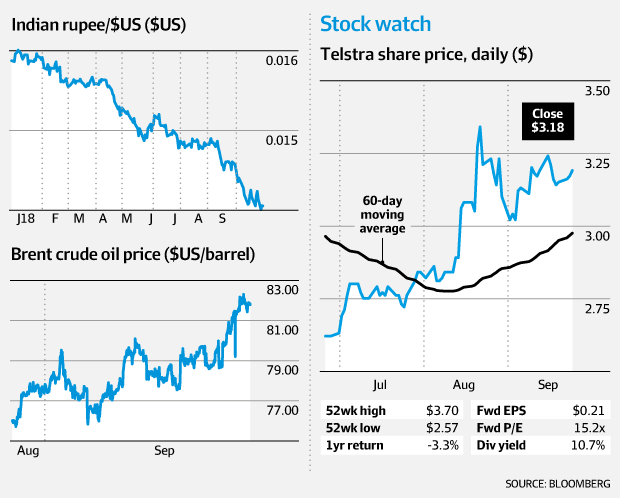 Traders are continuing to suggest that the price of Brent crude could top $US100 a barrel. The Indian rupee has continued its poor recent run of form and is now the worst performing currency in Asia despite the government’s attempts to stem the losses by raising interest rates. A large part of the drop is due to concerns about the divergence in global monetary conditions with US interest rates continuing to rise. Another major factor has been the increasing price of oil, with India importing most of its energy. Energy accounts for a large part of the bill for the average Indian and the rising oil price is set to squeeze living standards. Analysts say there is little more the government can do to stem the losses apart from raise interest rates. A note out of Credit Suisse hurt Australian Pharmaceutical Industries share price on Wednesday. The company’s shares fell 9.8 per cent to $1.71 after the broker downgraded its rating from ‘neutral’ to ‘underperform’ and dropped its target price from $1.63 to $1.55. Credit Suisse said that the stock’s outperformance was likely to depress following the company’s FY18 result, set to be released on October 18. The Priceline owner is facing increased competition from Beauty giant Mecca and discount retailer Chemist Warehouse according to the broker, who said the company is at risk of an earnings miss next month.